Keeping up with the Kardashians’ makeup routines is exhausting, especially since just about all of the sisters have successful lines of cosmetics now. We’re always waiting for Kylie Jenner to break the internet by launching yet another Kylie Cosmetics product, but the 21-year-old also has some other beauty tricks up her sleeves. The 21-year-old revealed on Instagram that this $10 organic oil gets her stamp of approval. But it’s not only Jenner-approved, but thousands of reviewers are also claiming it’s the key to youthful, glowing skin. See it: Grab the Kate Blanc Cosmetics Jojoba Oil for $10, available at Amazon! Please note, prices are accurate at the date of publication, April 11th, 2019, but are subject to change. The Kate Blanc Cosmetics Jojoba Oil is the miracle-in-a-bottle that has left so many speechless. It’s the one-stop shop when looking for a natural and organic oil when looking to combat every skin and hair-related issue under the sun. Plus, it also claims to have so many other long-lasting benefits, too. From longer and stronger nails to more moisturized cuticles, this small wonder looks to leave big results. It’s no wonder why Jenner is such a major fan of this tiny product. Jenner admitted that she is “obsessed with body oils” in a recent Instagram Story. “I literally drench myself in different organic oils every night,” she wrote when explaining her nightly routine, which makes sense since this oil has so many benefits when integrating into our nightly routines. From the reduction of acne scars and dark spots to even preventing breakouts, this is the all-in-one for flawless skin. The only ingredient in the bottle? Jojoba oil, of course! This cruelty-free oil is 100% organic and does not include any harmful chemicals that can damage our health or the environment. Whether hair, skin or nails, this oil looks to revitalize hair or even give dry and oily skin a more radiant vibrant look. For hair, it can help keep hair healthy and shiny by injecting follicles with the natural daily nutrients it needs to grow and promote strong and healthy locks. It’s extremely beneficial for those users who bleach their hair often and need a little TLC to repair brittle, dry or split ends. Simply add a little oil to shampoo and conditioner to promote hair growth or act as a natural anti-hair loss solution. Just as beneficial? This organic oil can help with dry scalps or even irritated skin. The organic oil is jam-packed with Vitamin E and antioxidants that can reduce dandruff. A little pro tip? Go ahead and mix this oil with a splash of peppermint oil. Not only will it smell oh-so-good, but it will also do good. This quick absorbing product is even better when used on the skin. It claims to be beneficial when looking to fight against inflammation and retain its natural glow and moisture. Even more amazing? It also claims to help reduce wrinkles and fine lines and even work overtime as an anti-aging product. 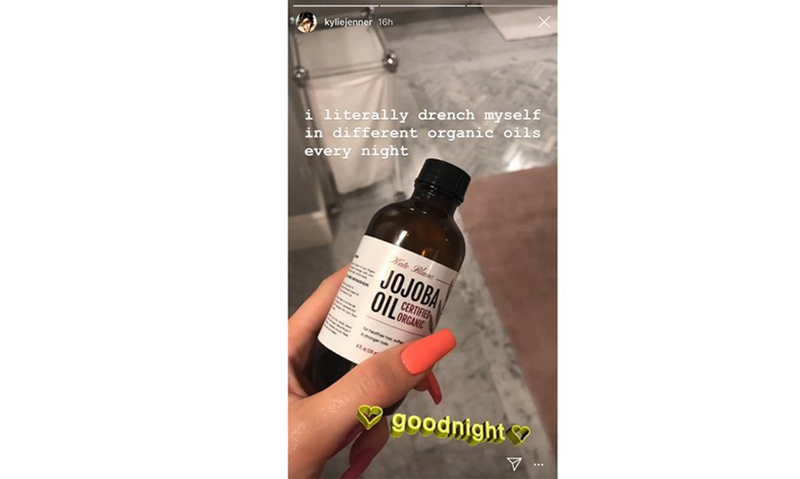 So when looking to for the moisturizer that has left thousands of reviewing claiming it’s the best, reach for this organic oil and get beauty rest just like Kylie Jenner does! Not your style? Check out additional Kate Blanc Cosmetics options also available at Amazon!